Seven years undergraduate and graduate work in Ancient Near Eastern and Classical languages. Extensive experience in C, C++, and Java programming languages. Background in professional photography and cinematography. Organized Initiative for Cuneiform Encoding that saw cuneiform accepted into Unicode. Originated and manages Digital Hammurabi Project. Milestone conference for the use of electronic resources in Ancient Near Eastern studies. With funding from Lee Watkins' Research & Instructional Technologies group, I, along with Bob Black and Bruce Wells, Hopkins graduate students in Near Eastern Studies, attend this international conference. I proposed to the conference two agenda items - the computer encoding of cuneiform and 3d scanning of cuneiform tablets. I was encouraged to pursue these endeavors, since no one knew of anyone else doing them. On the drive back the three of us brainstormed ideas and got very excited about the possibilities. The APL people expressed great interest in pursuing the project. Everyone was eager to pursue this project; said it fit in perfectly with work they wanted to do. I met with Dr. Andreas Andreou, Professor Electrical and Computer Engineering and two of his graduate students and brainstormed about various technologies useful for 3D surface scanning - laser rangefinder, atomic force microscopy, shape from shading using multiple lights, ultrasound, etc. Following months of emails with leading cuneiformists and Unicode experts I organized the first international Initiative for Cuneiform Encoding (ICE) conference at Hopkins. Funded by Lee Watkins (Hopkins Research & Instructional Technologies), Jim Neal (Hopkins Library), Gary Ostrander (Krieger School of Arts & Sciences), and Joey Zacharias (KSAS Magazine), the conference was an unqualified success, producing a unanimous statement of agreement on methodologies for encoding cuneiform and the electing a working group. Lee suggests we formally begin a cross-discipline "Virtual Cuneiform Project" at Hopkins and present the idea to Dr. Ted Poehler, Vice Provost of Research. I telephoned Dr. Rykle Borger in Germany and got his permission to use unpublished materials from his forthcoming 3rd edition of his book on cuneiform signs - Mesopotamsches Zeichenlexikon. Lee & I met for one hour with Ted Poehler, Vice Provost for Research. The meeting went very well. Dr. Poehler was very interested in the project and saw it as a cross-discipline, Hopkins-wide, endeavor. He also emphasized the possible broader applications for any technology we might develop. On the way back to Lee's office in Krieger Hall, Lee & I both stopped on the sidewalk when we realized in the course of our discussion about the data size for one high resolution 3D scan that it was one thing to pay for the hardware and software development of a 3D scanner, but quite another thing to plan for a petabyte scale digital library. That's when we realized that the digital library side of this project was immense. Lee begins researching funding for the project, discovers NSF's interest in cuneiform (Cuneiform Digital Library Initiative, UCLA), and suggests NSF for a grant proposal. We discuss intellectual property issues, candidate technologies, and funding strategies. The team formally begins working together. Jerrold Cooper contacts Robert England of the Cuneiform Digital Library Initiative at UCLA, who offers his support in scanning tablets with our scanners. On my recommendation, Lee Watkins approves funds to commission Linguist's Software to produce the world's first Unicode cuneiform font, based on Borger's fonts for MZL. Don Duncan emails first cuneiform 3D point cloud data from APL's optics lab. Lee and I meet with Jim Neal, Dean, University Libraries to discuss the desirability and feasibility of moving the Digital Hammurabi project under the aegis of Lee Watkins and the Center for Scholarly Research in the Library. The goal would be to provide high level, long term, managerial and fund-raising support for the project. The meeting was very encouraging, with Dean Neal agreeing to give executive support once all stakeholders agree to such an arrangement (which they did). First images from Computer Science rendering APL's first tablet scan. I suggest simultaneous fiducial scanning of top and bottom of tablet to help in stitching separate scans. Dr. Simo Parpola, director of the State Archives of Assyria, Helsinki, consultant to the Initiative for Cuneiform Encoding, enthusiastically agrees to collaborate with us in his online Corpus of Neo-Assyrian text database. Initially this would take the form of linking their Neo-Assyrian text transliterations to our 3D images. In addition, Dr. Piotr Michalowski, University of Michigan, Editor, Journal of Cuneiform Studies, Dr. Steve Tinney, University of Pennsylvania, curator of tablets, director, Pennsylvania Sumerian Dictionary Project, and Dr. Robert Englund, UCLA, Director, Cuneiform Digital Library Project, all go on record as supporting the Digital Hammurabi Project. Submitted Digital Hammurabi grant proposal to National Science Foundation/ITR . We receive notice that NSF has accepted our grant proposal for funding - one of the reviewers said "our proposal was head-and-shoulders above the others they reviewed, and among the best of it's kind they'd seen in years." Surphaser of Philadelphia demonstrated their technology at Hopkins and scanned a tablet for us. USA Today has article on cuneiform and talks about Digital Hammurabi. Gene Gragg, then Director of the Oriental Institute, University of Chicago, voices interest in, and support for, Digital Hammurabi scanning of tablets. Lee Watkins runs across a reference to Arius3D, a Canadian 3D scanning bureau, and I contacted them. We learn about Marc Rioux's inventions at the National Research Council of Canada, which were licensed by Arius3D. Don Duncan, Subodh Kumar, and I travel to Arius3D and have scans made of some of our tablets. I begin full-time work as a Scholarly Technology Specialist in the Library and manager of DH project, funded by the NSF grant. I attended the 48th RAI in Leiden and, among other things, visited at length with Dr. Rykle Borger, Goettingen University, and author of the forthcoming Mesopotamische Zeichenliste. Borger re-iterated his support for the Initiative for Cuneiform Encoding project and promised to continue to provide us with his materials as they became available. I travelled to London and met for an hour with Christopher Walker, keeper of cuneiform tablets, British Museum, and discussed the possibility of scanning their tablet collections. I delivered a presentation to the Rencontre on the progress in Digital Hammurabi & ICE. Don Duncan proposes we machine high resolution 3D targets to test actual resolutions and accuracies achieved by the various scanners. Jerrold Cooper and I visit with Dr. Steve Tinney, curator of tablets at University of Pennsylvania Museum, and director of Pennsylvania Sumerian Dictionary Project, to discuss access to tablets for scanning. I met with Mercedes Baird, CIO of the Library of Congress, and discussed large data center requirements. Eliot Metsger and I met with Dell and EMC2 about data center and mass storage plans. Eliot Metsger, Mark Cyzyk, and I met with Software AG, Tamino XML database people. I discussed Digital Hammurabi and ICE work with various attendees at the Society for Biblical Literature in Toronto - Philip Payne of Linguist's Software, Chuck Jones, Oriental Institute, Patrick Durusau, SBL, Dr. Wayne Pitard, Ugaritic scholar at University of Illinois, Deborah Anderson, Linguistics, UC Berkeley, Sandra Schloen, XML Specialist, Oriental Institute, and Dr. Bruce Zuckerman, West Semitic Inscriptions and InscriptiFact, USC. Don Duncan and I visit Marc Rioux and team at the National Research Council of Canada, Visual Information Technology Group, and have scans made of 5 tablets and 2 resolution targets. I estimated there was a 3- to 4-fold increase in information simply by switching to 3D display when viewing the tablets. The reported resolution was 100 microns. Don thought this was the best technology for our application we had encountered to date. An article in the Baltimore Sun newspaper, Sunday edition, focuses on Digital Hammurabi at APL and Hopkins. Dr. Marc Levoy, Associate Professor, Computer Graphics, Stanford, Director, Digital Michelangelo Project, presented at Hopkins Computer Science seminar. The Digital Hammurabi team had lunch with him. He agreed to share his 3D algorithms with us. Lee and I present at Museums & the Web 2003 conference in Charlotte, NC. I attended the Open Archives Forum Workshop in Berlin. The workshop focused on multimedia metadata harvesting. I interjected an awareness of 3D objects into the discussions and planning. I met for 4 hours with Dr. Peter Damerow, Max Planck Institute, mathematician specializing in the epistemology of cuneiform mathematics and one of the principals in the CDLI project, and with Urs Schoepflin, head of the Library, Max Planck Institute. They expressed an eagerness to collaborate with us in scanning and publishing 3D cuneiform tablets. I organized a 2 hour luncheon meeting at AOS in Nashville with ten of the leading cuneiformists in the US - Richard Averbeck, Giorgio Buccellati, Jerrold Cooper, Madeleine Fitzgerald, William Hallo, Cale Johnson, Piotr Michalowsk, David Owen, Matthew Stolper, and Niek Veldhuis. We discussed methodological issues related to encoding cuneiform. Lee Watkins arranges a meeting with Apple executives. Keith Kaneda and I met with them for 4 hours. Apple donated an xServe and 2.5 terabyte RAID to the Digital Hammurabi Project. I organized the second international conference of the Initiative for Cuneiform Encoding at Hopkins, where we finalized plans for the formal Unicode proposal, authored by Michael Everson, Karljuergen Feuerherm, and Steve Tinney. The cuneiform sign repertoire embodied in the ICE proposal was a truly historic milestone in cuneiform studies, representing, as it does, the merger of three of the most important cuneiform sign lists in the world, all of them previously unpublished, and with some of them in development for more than 40 years. The authors of these three sign lists, Miguel Civil, Rykle Borger, and Robert Englund, all gave ICE permission to use their unpublished materials in generating the sign repertoire for the Unicode encoding. Dr. Steve Tinney, Dr. Madeleine Fitzgerald, and Cale Johnson did most of the editing of the repertoire. 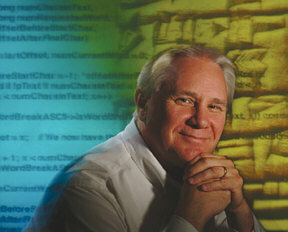 Steve Tinney created the Cuneiform Classic font for the proposal. 49th Rencontre Assyriologique Internationale, British Museum. I presented progress report on Digital Hammurabi Project and Initiative for Cuneiform Encoding. I spent 4 hours visiting and eating lunch with Christopher Walker, keeper of cuneiform tablets at the British Museum. We discussed efforts to collaborate in 3D scanning of cuneiform tablets. He also located, and let me photograph, an A = idu lexical tablet that had a reference I needed for an article I am working on. I arranged for the the Digital Hammurabi Project to host the Unicode Technical Committee meeting at Hopkins in November 2003. It was at this meeting that we presented the first formal proposal for encoding Sumero-Akkadian cuneiform. I visited with Alex Szaly, Hopkins professor in the Department of Physics and Astronomy, about his experience with large data center requirements in his work with the Sloan Digital Sky Survey. He sees good opportunities for us to pool our resources for a very large scale data center at Hopkins. The February 2004 Mountain View, CA meeting of the UTC favorably received, with a few suggestions, the final proposal for encoding cuneiform. I visited with Jim Gray, Distinguished Engineer in Microsoft's Scaleable Servers Research Group and manager of Microsoft's Bay Area Research Center (BARC) and discussed large data center issues. He is very interested in working with Alex Szalay and Digital Hammurabi in implementing a petabyte scale, web-enabled database. I attended the June meetings of the Unicode Technical Committee and Working Group 2 of the ISO 10646 committee in Toronto, where both groups unanimously approved the proposal to encode cuneiform. All that's left to do before cuneiform is formally approved as an international standard is the national balloting, which so far (December 2004) has been unanimously in favor of the proposal. I transferred to the Computer Science Department of the Whiting School of Engineering as an Assistant Research Scholar in September of 2004, where I continue to work on coding user interfaces for 3D cuneiform and Unicode encoded cuneiform text, and to continue working on the funding and logistics for a petabyte scale data center at Hopkins for 3D cuneiform texts. Original: Click Here For Link to The Digital Hammurabi Project Link Page - Dean Arthur Snyder Digital Hammurabi Director, Research Fellow, Engineer, Johns Hopkins University, Baltimore, Maryland. Updated: Click Here For John Hopkins University 2008 Updated Link Page With 3D Scanner Active Visual Window Along With Current JHU.edu Digital Hammurabi Project Link Page - Dean Arthur Snyder Digital Hammurabi Director, Research Fellow, Engineer, Johns Hopkins University, Baltimore, Maryland. This One: Click Here For Link To John Hopkins Magazine Article On Dean Arthur Snyder Research Scholar Feature Article. Click Here For Return To Daniel L. & Carolyn Sue Chesnut Link Page. Click For Return To Bible Files Reference Page.